The Brewers optioned Dubon (illness) to their minor-league camp Wednesday. Dubon was never a likely candidate to break camp with the Brewers after playing only 27 games at Triple-A Colorado Springs in 2018 before suffering a season-ending ACL tear. 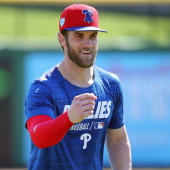 The shortstop reported to camp fully healthy but saw minimal action before succumbing to an intestinal illness that required a brief stay in the hospital. Dubon has since resumed baseball activities and is expected to be ready to handle a full-time role when the Brewers' new Triple-A affiliate in San Antonio begins its season.